The hip hop culture is a form of musical, physical and artistic expression, and Dance is a huge part of it. 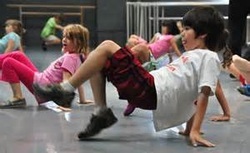 At Firebird, our music and movements are clean and are taught in a fun, energetic way. We focus on basic techniques including steppin’, poppin, toprock, gliding, music-video-style, and some simple floor work. Tricks, dynamic movements thrown in for a wow-factor, are always a favorite and will also be explored. Ages 5-12 enjoy a slower version of the adult class. Music selections and dance styles are geared more to their age levels. Students should wear comfortable pants and tee that will allow stretching and sliding. Dance sneakers like the ones pictured are highly recommended for ease in moving across the floor while reducing joint stress. Spins spots aid in fluid turns. Knee pads are not required but are helpful in learning certain moves..
more demanding, and more daring.